Find My Workspace lists over 95% of the serviced offices market in Kilmore Big. Simply click Request Quote to check pricing for one office, or Add to Basket for multiple offices. This serviced office suite comes fully furnished and will accommodate all stages of business growth. All offices are available on flexible terms and the impressive facilities, service and support systems guarantee immediate professional impact for your business. Here, clients benefit from a range of shared services including meeting/conference facilities, access to business support in addition to state-of-the-art IT and telecoms infrastructure. In addition, office space requirements are maximised because you have the option to expand or reduce office space as your business requires. 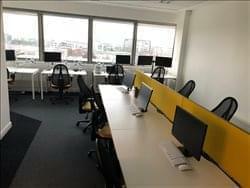 The building is accessible 24-hours a day and tenants also benefit from air-conditioning, a cleaning service and unlimited access to the on-site meeting room. There is also an on-site café to enjoy throughout the day. To obtain information for your selected Kilmore Big Serviced Offices, please tick the "Add to basket" box for each office you prefer and complete the form below. We will then send a detailed report via email.